All prayer which deserves the name must be inward. The term inward is used here to describe a form of prayer which moves, as it were, away from the spoken word and toward silence. As to contemplative, this term is rather too wide and general to describe a form of prayer whose main feature (or trend) is to draw away the soul from the manifoldness of mental activity and to enable it to become single-pointed. The term meditation also does not fully convey this meaning. Of the two, contemplative prayer is probably the more accurate term — so long as we bear in mind the sense in which the word contemplative is used. This form of prayer stands in a very special relationship to truth. Oral or spoken prayer — also an inadequate description — addresses itself to God for a specific purpose. Although it is rooted in the truth of faith, it does not directly concern itself with this truth. In spoken prayer we adore, beseech, or give thanks. Contemplative prayer, however, is concerned with the truth as such. It tries to apprehend the nature of God, to grasp the meaning of the kingdom of God, to gain insight into the condition of man and an understanding of one’s own place in the pattern of things, to obtain a true picture of the world. This search after truth is far more than an endeavor of the intellect; if it were merely that it would find its expression in theology or philosophy. It is an endeavor of an entirely different order, in which the whole of man is involved. With the faculty of imagination we focus on and visualize the theme or subject of our contemplation; with our intellectual-critical faculties we probe, scrutinize, compare; we try to distinguish between the essential and the incidental, between end and means, between the valid and nonvalid. Our feelings cannot remain detached in this spiri­tual quest. We shall experience in turn elation and dejection, kinship and loneliness, yearning and fulfillment. When contemplative prayer is rightly practiced it will sooner or later tend to become very simple. To begin with, we usually need for it an extensive subject matter, which we can approach in many different ways and with a wide range of notions, considera­tions, expectations, and resolutions. Step by step, however, the subject of contemplation will become both simpler and more compelling. Our thoughts will diminish in number but gain in depth and concentration. The words will come more sparingly, and ultimately the inward prayer is resolved in silence or even in something which goes beyond the duality of speech and silence. This article is a sample from Romano Guardini’s THE ART OF PRAYING. Click image to preview or order. We do not seek the awareness which comes to us in contemplation for its own sake. We seek it so that it may guide our actions. By contemplative prayer we seek to strengthen and to give direction to our will in order to master the confusion of life and to create the conditions for better and more fruitful action. Contemplative prayer must not induce a state of dreaminess and unreality; on the contrary, we must remain alert throughout, conscious of the relationship to God which we are trying to establish. Contemplative prayer should be a living encounter between man and God in which man strives to get nearer to God and in so doing to become purer, simpler, and more substantial. Although contemplative prayer may also concern itself with moral questions and problems of ordinary life, this is not its proper domain. What we are striving to apprehend in contemplation are not the truths of the empirical world and of existential experience, but the truths of divine Revelation that have come to us in the word of God and the life of Christ. There is something very special about revealed truth. It contains the most profound essence-being of the world and of man; but it expresses it as seen by God, embedded in the self-manifestation of God — God who is hidden and unknown, who declares Himself only through Christ. This revelation is embedded in His message on the meaning of existence, which thus becomes the judgment of the All-Holy over the defection of man and at the same time a call to conversion. Revelation does not mean that a higher plane of cosmic knowledge opens itself to us, but that the holy God calls to man — who is shut in and isolated by his willfulness — asking man to turn toward Him and understand the meaning of existence through the word of God. It is not demanded of us that we should learn hitherto unknown facts and inner connections. It is demanded of us that we should accept aspects of truth which we can receive only from the mouth of God and that we should make the truth our own through faith. To make this truth our own we must grow into it, become one with it. Our willfulness resists this. Understanding therefore demands that we should change not only our ways but our way of seeing and of judging, our sense of what is true and what is false, of what is real and what is appearance, and, generally, our sense of value. Our spirit must work its way into the holy words; our heart must get accustomed to them. Only by doing so shall we be able to grasp the divine message. This book deals with practical things. We must ask ourselves about the right way to set about contemplation. Once again the first and most important step is preparation and here we must distinguish between what we might call the more distant and the more immediate preparation. The more distant one consists in selecting and preparing the subject of contemplation. This cannot be done in a haphazard manner. We must know where to begin and we must know what kind of subjects there are for contemplation. It could be some article of faith or some thought by an enlightened person. The most appropriate subject, however, will always be the Scriptures and, above all, the person and the life of Jesus Christ. His words “I am the way, and the truth, and the life” express in the clearest possible manner what is involved in contemplation: the way from the Father to us and from us to the Father, the holy truth which reveals itself along this way, and the life which we partake of in Christ. There are many books on contemplation, some of which are extremely useful for beginners. They give the key to understanding passages in the Scriptures and show us the lessons which may be drawn from them. In the long run, however, such ready-made contemplations are rather artificial and miss the essential thing. The essential thing is the divine presence as revealed to us in the Scriptures; therefore the book of contemplation proper is no other than the Bible itself. Our preparation, then, consists in selecting an appropriate text. One might choose, for example, one of the Gospels or the Acts of the Apostles, or one of the Epistles and take a passage from any of these every day. It should not be too long, lest we lose control over it; nor should it be too short. One might choose, for example, one event in the life of Christ or a passage from His teaching. As time goes on we need less and less until we reach a point when one sentence is sufficient. We should prepare the text, having selected it beforehand, preferably the evening before, so that it is ready in the morning. We should then decide on the main idea or point of view which is to govern the contemplation or on the particular question to which the contemplation is to supply the answer. If necessary, we should consult some commentary or exposition so as to be quite clear about the meaning of the text. All this belongs to what we called the more distant preparation. The immediate preparation is even more important. 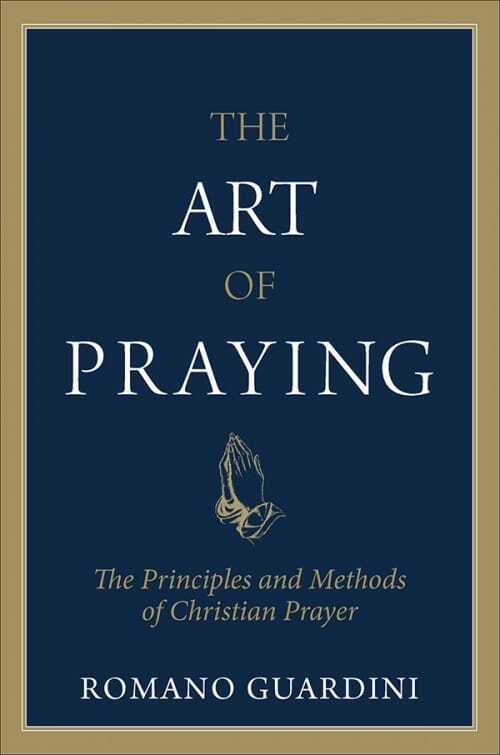 Everything that has been said in the first chapter of this book on general preparation for prayer applies here and it applies to an even higher degree. In spoken prayer the words themselves and the contents of the prayer help to keep the prayer alive. With purely contemplative prayer the danger that it might become dull or apathetic or that it might peter out is much greater, and we must guard against this. Thus thought itself becomes prayer, and it is right that it should be so because contemplation is not a form of study but is conver­sation with God. If we have sufficient power of visual imagination, then we should attempt to converse with Christ as though He were actually present. If we are unable to do this, we should remind ourselves that our Lord, on whose life we are meditating, is present with us at all times, not just vaguely and remotely, but here and now. The Christ of whom the Gospels speak abides with us, and He abides with us in a very special way: it is He who indicates the meeting place to us. If the worshipper had the psychic faculty of “seeing” the situation as a whole — that is to say, himself and the circumstances at the moment of prayer — he would understand that the situation was brought about in the first place by Christ’s presence. Thus it is not so that man, having decided of his own power to seek our Lord, then finds his way to Him; it is our Lord who is there first and who calls to man: “Approach and be with me.” This is the precondition which makes prayer possible and enables us to offer up to God our faith and love and put before Him whatever is in our hearts. This does not exhaust the meaning and purpose of contempla­tion. Contemplation must affect life itself. However, we must not interpret this in too narrow a sense. Some people think that unless some specific error has been clarified or some definite resolve has emerged, contemplation has not served its purpose. This is a mistaken view. To dwell for awhile in the presence of Christ in contemplation is in itself a holy and salutary event which may affect us profoundly; for whenever we apprehend some particular trait of His holy character or appreciate the significance of one of His sayings, our spirit is enriched. At the same time we must not disregard our own personal and immediate problems. The Apostle says: “What things soever were written, were written for our learning.” Thus a road leads into our life from every word in the Gospels. In their light we see how things stand with us. We feel a sense of guidance and it becomes clear to us what we ought to do and what we ought to avoid or overcome. This leads — or ought to lead — to clear decisions and resolves regarding our conduct of life and our duties toward God and man. These resolves should be made before God and should become part of our life. From such repeated self-examination there slowly emerges a better understanding of one’s own character, of one’s faults, and of one’s good and bad potentialities; a better insight also into life and its tasks; also a better understanding of the people with whom we are brought into daily contact. In this manner we are being instructed from within and acquire a new security which we could not gain in any other way. It is of paramount importance — we must repeat this — for contemplation to become prayer. The worshipper must reach out to the living God, must become aware of His holy presence, must seek out His holy countenance and enter into His heart. Contem­plation should become a real dialogue in which man’s I faces its true Thou, which is God. This is what fundamentally matters, so much so that there would be no further need for questioning, considering, and resolve, provided that this holy encounter were brought about at the very outset. Editor’s note: This article is an excerpt from Guardini’s The Art of Praying: The Principles and Methods of Christian Prayer, which is available from Sophia Institute Press. Romano Guardini (1885–1968) was ordained a priest in 1910. He was a professor at the University of Berlin until the Nazis expelled him in 1939. His sermons, books, popular classes, and his involvement in the post-war German Catholic Youth Movement won him worldwide acclaim. His works combine a keen thirst for God with a profound depth of thought and a delightful perfection of expression.